Put leftover turkey (or chicken!) 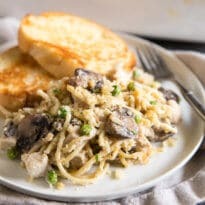 to work with this easy Turkey Tetrazzini casserole. 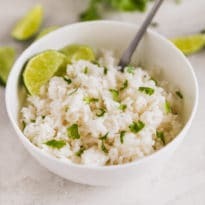 Creamy, comforting, and freezer friendly too! Scroll down for an easy video tutorial! Turkey Tetrazzini is my unicorn. I’ve never seen it (or had it), but I knew it existed. And I knew it was MAGICAL. It’s really similar to many of the casseroles my mom made while I was growing up, though. The only difference is the noodle (she tends to use macaroni) and the cream of soup (nothing canned here). So, it’s kind of like being reunited with a long lost… well… unicorn. I’ve actually been making this casserole all summer long (despite the 110 degree temps in Los Angeles) because I love it so much. But, I decided to hold off on sharing it with you until we were in “fall food mode.” Whatever that is. Ever since I did a post for National Turkey month, I’ve been obsessed with buying turkey tenderloin. You get two turkey tenderloins in a pack and you just bake them on a sheet pan for 40 minutes. Then I cut it up and keep it in the fridge for things like Turkey Tetrazzini. Other people take pretty pictures of this and call it “meal prepping,” but I just like to have protein on hand. Leftover rotisserie chicken works great too! 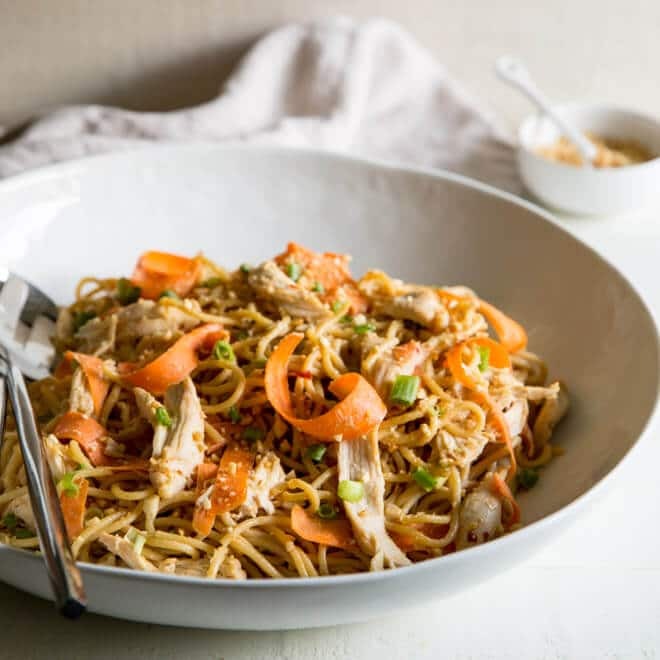 Definitely print off the Turkey Tetrazzini recipe and shove it in your cookbook for after Thanksgiving. It’s the best way to put your leftover turkey to work! And if you make the recipe every weekend between now and the end of November, you’re in good company. 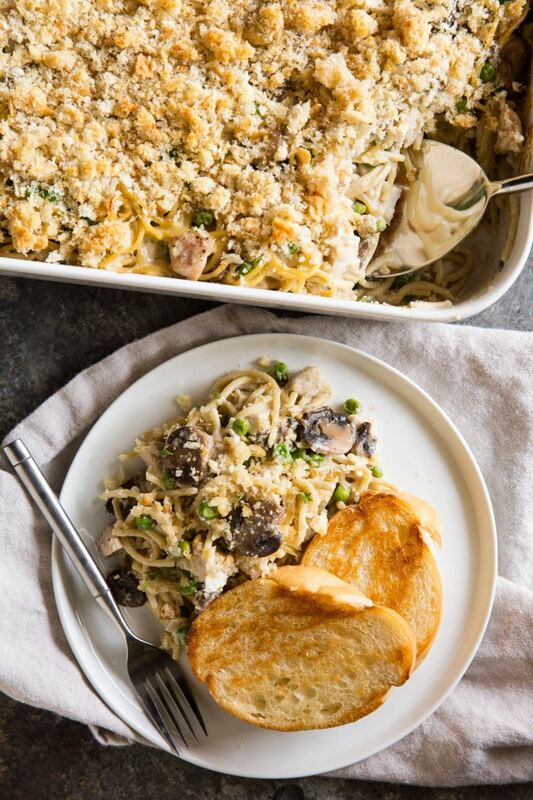 Save this Turkey Tetrazzini to your “Main Dishes” Pinterest board! Put leftover turkey (or chicken!) 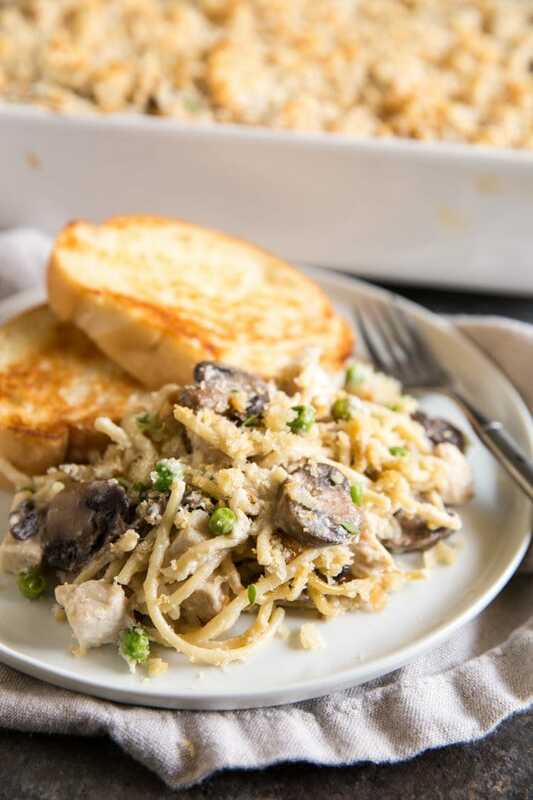 to work with this easy Turkey Tetrazzini casserole. 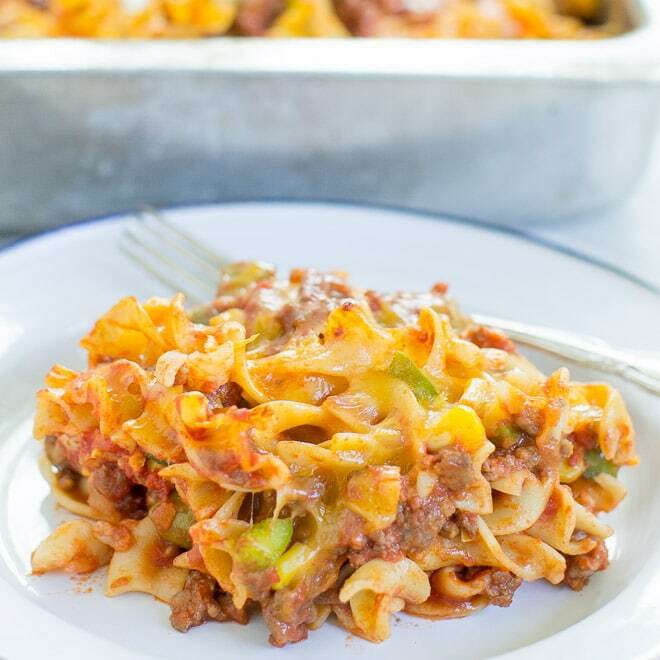 Creamy, comforting, and freezer friendly too! In a food processor, process the bread and butter until coarsely ground, about 6 pulses. Set aside. In a large pot or Dutch oven, bring 4 quarts water and 1 tablespoon salt to boil. Add pasta and cook until al dente, about 11 minutes. Drain well, keeping in colander, and toss with olive oil. To the pot with sauce, add pasta, turkey and frozen peas, stirring to combine. Pour into a 13-inch by 9-inch baking dish. Sprinkle with crumb topping. Adapted from The Cook's Country Cookbook. I think you just hit the mother lode!!! This has got to be a hit and right up there with your Cincinnati Chili…. Can you use milk instead of half and half? Hi Vanessa, yes definitely! It just make take a little longer to thicken in Step 6. But it will still taste amazing! Thanks for the question. Hi Shawn, that sounds like a fantastic idea which I am going to try. I think you’re right… celery would be perfect here! My mom used cream of celery soup in all her best casseroles growing up, so I think I’d like that as well. Thank you so much! i had to improvise with this recipe due to what was in the fridge and pantry Christmas Day. My meal was Christmas Eve so no need to cook that day except to heat up the feast from the night before, right? My in Law’s Family Tradition: Leftovers the day after a feast. So my mother in law made turkey tetrazzini look effortless and in a 50″s style, Don Draper type. It was delicious and my 2 daughters loved it. 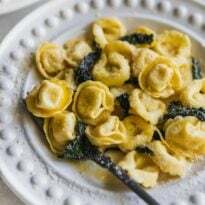 When i used this recipe i only had shredded parmesan cheese and it turned into rubber in my sauce. Is there a way to recover? Hi Amy, I’m so sorry you had trouble with this recipe and right at Christmas to. I don’t think it was the fact that you used shredded parmesan instead of grated because I’ve used various cheeses and not had this problem. It sounds like your sauce seized up. Usually this happens when the sauce is too hot or the cheese is too cold or some of each. Or, if you didn’t stir it immediately that can happen. The recipe says to remove the pot from heat before adding the cheese, but perhaps the more complete answer is to let the sauce cool for a minute or two before adding the cheese so this doesn’t happen. I haven’t had a problem with cheese seizing personally, but this is my best guess. To save it at this point, although I suspect you’ve given up by now, I’d probably try adding a little bit of water (maybe a few tablespoons?) and stir gently to try to get all the cheese up to temperature and loosened out. This is just a guess. I’m really sorry you had an issue with the cheese.